Team Draft is sending two lung cancer survivor-advocates to the Super Bowl in Minneapolis Sunday. It's part of a national effort to raise money and awareness of lung cancer, lung cancer research and patient treatment. For the fourth year in a row, Team Draft is sending lung cancer survivor-advocates to the Super Bowl, Pro Bowl, Taste of the NFL, and the College Football Playoff (CFP) National Championship. But this year marks the first time that Team Draft will send two survivor-advocates to the Super Bowl. Our participating survivor-advocates are all winners of Team Draft’s fourth annual Lung Cancer Survivors Super Bowl Challenge— a unique fundraising challenge designed to give lung cancer survivors the opportunity to compete against one another to raise funds for public awareness and cutting-edge research that is giving new hope to those battling this often misunderstood disease. Participating survivors who raise more than $1,000 during the Super Bowl Challenge may commit 50% of the funds they raised to a lung cancer organization or cancer center of their choice while survivors who raise more than $5,000 can commit 80% of the funds they raise to the lung cancer organization of their choice. While the Challenge is over, the fundraising continues through Super Bowl Sunday. Founded by former NFL linebacker, Chris Draft, and his late wife, Keasha, who died of lung cancer in 2011 at the age of 38, Team Draft is dedicated to raising lung cancer awareness and increasing badly needed research funding through its Campaign To Change The Face Of Lung Cancer—a campaign committed to shattering the misconception that lung cancer is a “smoker’s disease.” At the center of Team Draft’s Campaign is its annual Lung Cancer Survivors Super Bowl Challenge. This year’s top two fundraisers are Linda Wortman and Matt Arensdorf. A Minnesota native, Linda Wortman is thrilled to be in her hometown for the Super Bowl. “January 11, 2018 marks the 10-year anniversary of my lung cancer surgery and of being a survivor,” Linda explains. “I am honored to be a 2018 Super Bowl Challenge winner and I want to be a strong advocate and positive presence representing all survivors throughout the remaining weeks of the Challenge,” she says. Linda and her husband, Jerry, will represent Team Draft at the Super Bowl and at the 27th Annual Taste of the NFL—an annual food and wine festival held the night before the big game. At the Taste, Linda and Jerry will sample dishes from top chefs from the best restaurants in every NFL city and rub shoulders with legendary players from all 32 teams—including members of the Pro Football Hall of Fame. 80% of the funds Linda raises during the Challenge will go to the Mayo Clinic in Rochester, Minnesota. Diagnosed in February 2016, at the age 32, Matt Arensdorf is a two year lung cancer survivor from Colorado. Like Linda and Jerry, Matt and his wife, Jen, will represent Team Draft at the Super Bowl and the Taste of the NFL. But for Matt, the Super Bowl Challenge means so much more. As Matt explains, “the Super Bowl Challenge is an amazing way to not only raise funds for lung cancer research but bring much-needed awareness to the disease. Getting to go to the Super Bowl is the cherry on top!” “We are incredibly excited for this opportunity and can’t thank everyone enough who helped us get here,” he adds. Matt has elected to direct 80% of the funds he raises during the Challenge to the Lung Cancer Colorado Fund at the University of Colorado Cancer Center in Denver, Colorado. 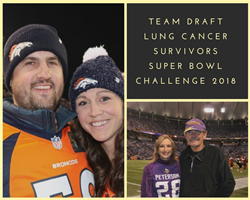 Team Draft’s 2018 Lung Cancer Survivors Super Bowl Challenge continues through February 4—Super Bowl Sunday. To donate, please visit http://www.crowdrise.com/2018SuperBowlChallenge. Team Draft, an initiative of the Chris Draft Family Foundation, is dedicated to raising lung cancer awareness and increasing badly needed research funding by shattering the misconception that lung cancer is a “smoker’s disease.” The fact is, anybody can get lung cancer. Yet, despite the fact that between 20,000 and 30,000 people who have never smoked—including Keasha—are diagnosed with lung cancer in the United States each year, the smoking stigma negatively impacts lung cancer research funding, which pales in comparison to funding for other major cancers and diseases. Team Draft is out to change all that. “If we can take away the stigma that says you have to be a smoker to get lung cancer, we have a real chance to educate people about the true nature of the disease,” explains Draft. To learn more about Team Draft, share your story, or make a donation, please visit http://www.teamdraft.org.